But there’s no ideal way to get it. The hits keep on coming. After losing Dejounte Murray for the season and Lonnie Walker IV for eight weeks, the Spurs will also be without Derrick White for a while. The 24-year-old guard could be sidelined for up to two months with a heel injury. It’s not exactly an assurance that the Spurs will make an addition, but it seems to be an acknowledgement that they will at least consider it. In the meantime, Bryn Forbes has gotten the nod to be the new starter. It’s not an ideal fit but if White’s prognosis is better than first reported, he could serve as a passable stopgap in the short-term. So let’s take a look at all the Spurs’ options as they attempt to navigate this trying stretch of their season. Forbes started against the Magic. He also closed the game against the Hawks guarding Atlanta’s point guard. Pop seems to trust him to be able to perform the basic duties of the position, which explains why he’ll be the starter on opening night. The fit might be more seamless than it initially seems. Forbes can shoot, which makes him a good partner for DeMar DeRozan. Defensively, he might struggle against the quicker point guards, but he seems stronger than he’s been in the past and plays with energy. That could go a long way towards making him a neutral defender. There are drawbacks to relying on Forbes, of course. His ball handling could be an issue if he faces pressure and he doesn’t have the length to make the defensive impact that Murray and White could have. If he starts at point guard, that would have an effect on the rotations. Forbes was supposed to log some time at shooting guard, so Pop would have to bump the playing time of DeRozan and Marco Belinelli to absorb those minutes, which is not ideal. The other option, expanding the rotation to include Quincy Pondexter or play Dante Cunningham or Davis Bertans at small forward some, is even less appealing. If it looks like White could return in two weeks, Forbes might be able to perform well enough to make signing a veteran unnecessary. If the injury sidelines White for longer, the Spurs would probably need to make a move. The Spurs could get ambitious and try to swing a deal for a starting-quality point guard. Unfortunately, that could be extremely difficult to do without parting with some young prospects. San Antonio can’t trade the players it signed this past offseason until December, which means Bertans, Belinelli, Forbes and Gay can’t be a part of any trade package. Those guys have mid-sized contracts that make it easy to match salaries. The other veterans don’t. They are also not on expiring deals. Gasol makes $17 million this year and has part of his contract guaranteed for next year. Patty Mills has two years left after this one on his contract. It’s hard to see another franchise trading a good point guard while taking future salary, even if the Spurs throw in the Raptors’ 2019 pick as a sweetener. Especially this early in the season. The Cavaliers might eventually try to move George Hill, for example, but will likely wait until they figure out if they can make the playoffs before pulling the trigger. There might be backups available, but they typically have smaller contracts, which would force the Spurs to include their young guys for salary-matching reasons. 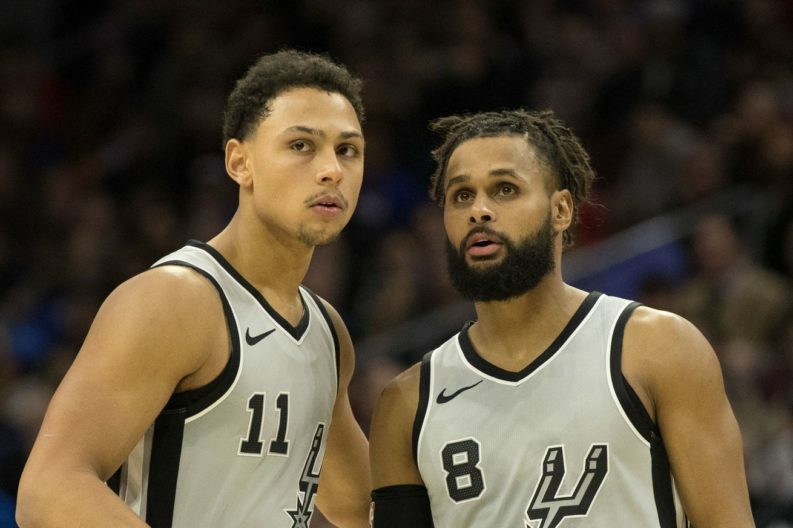 Maybe the Bucks and the Nets would part ways with Malcolm Brogdon and Spencer Dinwiddie, respectively, but those guys make so little that the Spurs would have to send back White or Lonnie Walker. The Spurs have veterans with likely negative trade value due to their big contracts, lack mid-sized deals to easily match salaries and probably won’t want to part with their young guys to find a stopgap option. A trade is unlikely. With teams trimming their rosters for the beginning of the season, there are now a handful of available guards on the market. From veterans like Jamal Crawford and Jarrett Jack to younger guys like Tyler Ulis and Chasson Randle, the Spurs have options if they want to add depth. It might not be a bad idea to do so, considering Forbes’ lack of experience at the position. They would have to waive Pondexter to make a veteran addition, but that’s not a heavy toll to pay, considering how pedestrian Q-Pon has looked in preseason. As for the younger guys, they qualify to receive two-way contracts. The Spurs are surely at least considering making a signing. Yet they also certainly know that the guys still on the market won’t have a big positive impact on their chances of surviving the start of the season. Anyone not signed at this point is available for a reason. The vets are no longer effective and won’t likely revitalize their careers at this point. The young players rarely turn into New York-era Jeremy Lin. There are some exceptions — Tim Frazier would be a good pickup if he’s waived by the Bucks — but by and large any free agent the Spurs can get would not be a significantly better option than what they have now. Since a big trade is unlikely, however, making a small signing could be smart. It won’t change the course of the Spurs’ season but it could allow Pop to keep his rotation players fresh and, depending on who they add, to throw a more traditional point guard out there for stretches. There’s no ideal solution to the Spurs’ predicament, but adding some depth shouldn’t hurt.